We’re back from Chicago and had a great trip. Turns out PBS is working on a program on religion and medicine, which was the theme of the conference that I attended. Michelle was filmed back at the university and at the scene of her accident. I did a three hour interview with the producers. Maybe you’ll see us on TV but it won’t be for awhile. We all came home exhausted. Michelle and I are packing our bags and getting ready to go to Chicago next week. I’m presenting a paper at the Inaugural Conference on Medicine and Religion sponsored by the University of Chicago. We hope to get back to the U of C campus for a memory visit. We’re not sure who is still in Chicago but we’ll be at the Westin Hotel on Michigan Ave. if you wish to contact us. Chicago here we come. Happy Mother’s Day! All mothers are special but a special salute to those mothers who are caring for children with disabilities. You are my heroes. 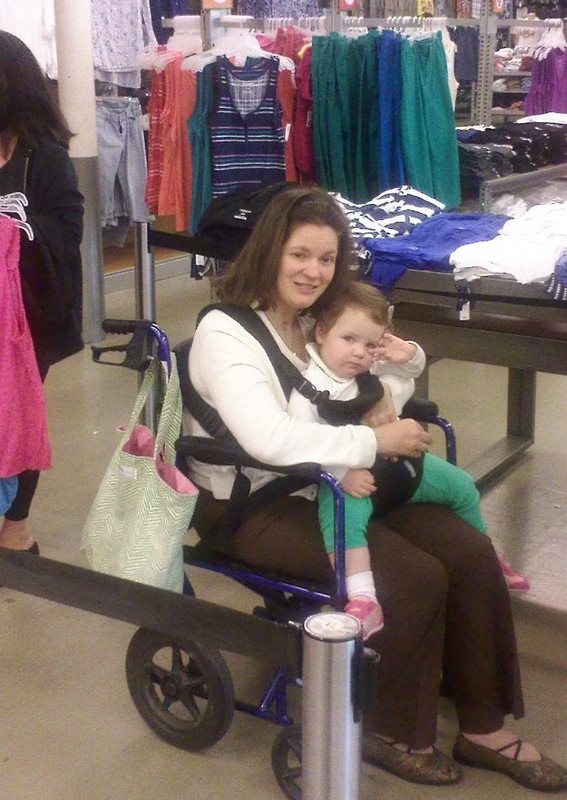 Here’s Michelle shopping with her niece Summer. Should Parenthood Be Denied to Persons with Disabilities?